Butternut squash is my new favorite! If you haven’t tried it lately, you’re missing out. 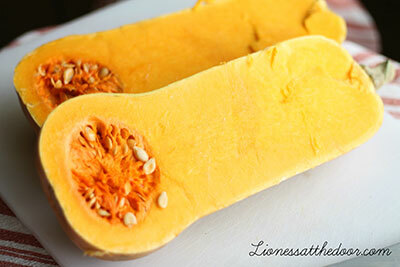 Cut the squash in half lengthwise and scrape out the seeds and pulp. Put the squash flesh side down in a casserole dish with about a half an inch of water in the bottom. Cover and bake for about 45 minutes, or until you can pierce the skin with a fork. Once it’s cooked and peeled, you can use this versatile veggie in so many things! You can eat it with Real salt and butter, or puree it in a food processor with a little salt, butter and sweet spices for a nice side dish, mash it for baby food or use it in recipes calling for pumpkin. (After tasting recipes with fresh squash, I’d be surprised if you want to use canned pumpkin again.) Bake and then freeze for super easy baking!